Dan O’Neill is an experienced litigator who focuses on complex commercial litigation, regulatory investigations, white collar criminal litigation, and intellectual property litigation. He has represented institutional and individual clients in a broad range of matters involving the federal securities laws, antitrust, contract, fraud, and copyright. He has also represented financial institutions, professional firms, and their officers and employees in numerous investigations by the Department of Justice, the Securities and Exchange Commission, the Financial Industry Regulatory Authority, and state regulators, and he has worked on a number of internal investigations. 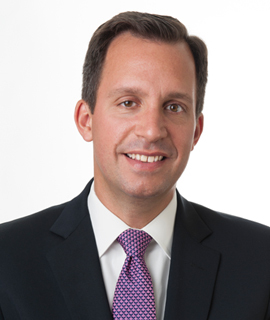 Prior to joining Shapiro Arato Bach LLP in July 2011, Dan worked at Davis Polk & Wardwell LLP. Dan also served a six-month term as a Special Assistant District Attorney for the Kings County District Attorney’s Office, where he tried three felony cases and one misdemeanor case to verdict. He clerked for the Hon. William H. Pauley III of the United States District Court for the Southern District of New York. Represented individual directors of publicly traded company in connection with federal criminal investigation and trial of company’s CEO and outside counsel. Lead counsel representing shareholder of a closely held aviation company as plaintiff in a derivative action pending in New York County Supreme Court. Co-authored briefs in Second Circuit appeal of former New York Senate majority leader Dean Skelos, resulting in vacatur of his conviction and remand for new trial. Co-counsel for petitioner in Salman v. United States, criminal insider trading case argued in the Supreme Court of the United States in October 2016. Represented several individuals in criminal prosecutions for bank fraud and public benefits fraud. Won Second Circuit appeal reversing insider trading convictions of Todd Newman and Anthony Chiasson. Assisted partner Alexandra A.E. Shapiro in her capacity as Independent Consultant retained by NYSE Euronext, pursuant to SEC Order, to conduct a comprehensive review of the market data delivery systems, and the policies, procedures and practices regarding compliance with Rule 603(a) of Regulation NMS of NYSE’s securities exchanges to ensure that the systems comply with Rule 603(a). Represented Fortune 500 company in complex commercial dispute involving the divestiture of European business unit. Conducted internal investigation on behalf of Audit Committee of publicly-traded financial institution into whistleblower allegations of financial impropriety, and provided recommendations for enhancing internal controls. Represented computer services provider in breach of contract and unjust enrichment action brought by former customer. Successfully resolved the action after our client counterclaimed. Obtained dismissal with prejudice in case of first impression regarding the transfer of ownership and work-for-hire provisions of the U.S. Copyright Act. Represented major record company in arbitration over payment of royalties. Successfully resolved the matter after extensive pre-hearing briefing.